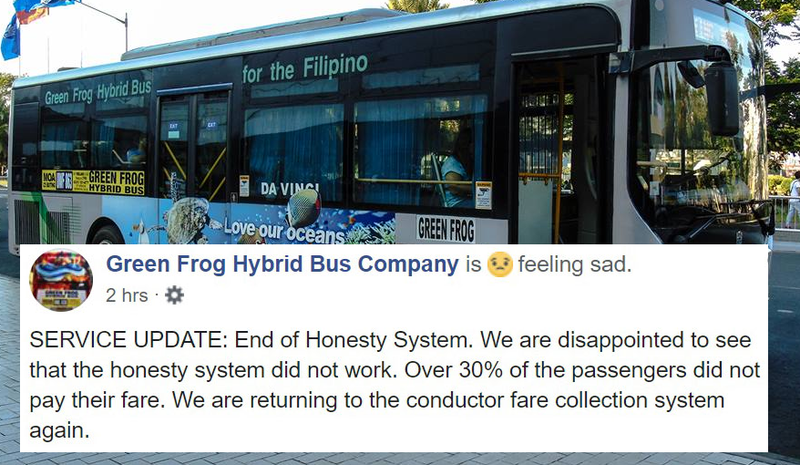 The Philippine Frog Hybrid Bus Company had announced to end its "honesty fare system" after a week of experiment. The bus firm posted a bad news, "End of Honesty System. We are disappointed to see that the honesty system did not work. Over 30% of the passengers did not pay their fare. We are returning to the conductor fare collection system again," it could be read on the announcement. The bus company is experimenting the honesty fare system were passengers can pay their fees using exact fare or by using tap cards. The honesty system implementation was supposed to eliminate the usual conductor format. Unfortunately, the result was far from the Green Frog expectations. Well, it seems that this kind of experiment wasn't the first time for Filipinos honesty being tested. Previously, the Manila Police District closed down its 'Honesty Store' after it lost Php 20K over 6 months of operation. Due to the heavy losses, the company has decided to return to the conventional conductor fare collection system.